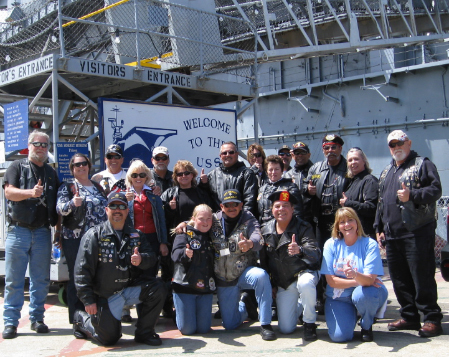 » California: USS Hornet, Heroes Of The Pacific Warriors' Watch Riders: WE HAVE YOUR BACKS AT HOME! This was a special event put on by the USS Hornet.The HBO show “Pacific” was being Honored on the Hornet.With the showing of the 1st & Last episode. We staged up at the local Starbucks,we headed out with 6 bikes.There was a second staging near the Hornet at a Starbucks. When we got there ,we were met by 9 more bikes.Some were WWR and some were PGR. We rolled over to the Hornet,which was right down the street.We parked next to the ship and proceeded onboard.Many folks came to this event,from Pearl Harbor Survivors to Vets from Vietnam.Also Chuck Tatum was there signing his book”Red Blood,Black Sand” , he was also at Iwo Jima and protrayed in the Show “Pacific”. Chuck was 17 when he joined the Marines in 1943.He was with B Company,1st Battalion , 27th Marines. 5th Marine Division. It was a very great Honor to meet this man ,who lives right here close to us. Met alot of WWII Vets this night,onboard a very Historical Ship. No user commented in " California: USS Hornet, Heroes Of The Pacific "